← Are The Hangover Stars Drunk On Power? One that did do justice to its source was Quentin Tarantino’s Jackie Brown, based on the novel Rum Punch. Tarantino has been a Leonard fan since his teens, and has a similarly great ear for dialogue, so it was no great surprise that Jackie Brown turned out to be one of the best Leonard adaptations. News comes this week from Variety that one of the latest attempts to bring his work to the big screen, Switch (based on The Switch), has cast its two male leads. The link here is that the two characters were the villains of Tarantino’s Jackie Brown, Ordell Robbie and Louis Gara. The Switch was written before Rum Punch, and sees a younger Robbie and Gara planning a kidnapping which, inevitably, goes wrong. Instead of Samuel L Jackson and Robert De Niro, this time around the younger Robbie Gara will be played by Yasiin Bey, formerly known as rapper Mos Def (The Hitchhikers Guide to the Galaxy) and John Hawkes (Winters Bone) respectively. Switch joins another Leonard adaptation, Freaky Deaky, on the slate. Freaky Deaky is expected to be released in 2012, no word yet on Switch. I’m cautiously optimistic about this news. I’m a huge Elmore Leonard fan, and have been for many years. As mentioned at the beginning of the article, however, his work has not always been handled well on the big screen. My favourite of his novels, Out of Sight, is also my favourite of the Leonard adapted movies, by Steven Soderbergh. It sits alongside the afore-mentioned Jackie Brown, and Barry Sonnenfeld’s Get Shorty as the only adaptations worth watching. The rest range from the passable (Touch) to the downright dreadful (The Big Bounce). Leonard is a producer on Switch, which on the face of it is a positive. He obviously likes the script, and is confident it will do justice to his work. He is executive producer of the TV series Justified, based on his character Raylan Givens, and fulfilled the same role on Jackie Brown. He also, however, was executive producer on the abomination that was Be Cool, the ill-advised sequel to Get Shorty, and the disastrous Pronto. Pronto had numerous reshoots, was edited to ribbons, and only ever saw release in 5 theatres in the US. So, whilst Leonard’s name on the cover is a guarantee of quality, his name on the movie credits is no guarantee of anything. With an inexperienced director in Dan Schechter, who also wrote the screenplay, Switch is so far an unknown quantity. 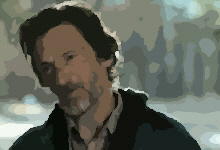 The casting of John Hawkes is, however, promising. He was nominated for an Oscar for his role in winter’s Bone, and also received plaudits for his work in last year’s Martha Marcy May Marlene. Yasiin Bey has also done some solid work, most notably in The Hitchhiker’s Guide to the Galaxy and the TV series Dexter. I’m hoping Switch, and Freaky Deaky, add to the short list of good quality Elmore Leonard adaptations. It’s frustrating watching his beautifully written novels mistreated time and time again by Hollywood, and the few times it has looked like we might get some great films, the projects have remained dormant. Tarantino bought the rights to several of his books, and was looking at making Killshot in particular at one point, which was to star John Travolta. Also, at one point, the Coen Brothers were apparently looking to adapt the Cuban war-set Cuba Libre, but nothing came of that either. Until another high profile project is in the works, we have to hope these smaller, independent films can get the job done. This entry was posted in Articles, News and tagged adaptation, casting, elmore leonard, jackie brown, john hawkes, mos def, news, rum punch, switch. Bookmark the permalink. Thanks for sharing man, your blog is awesome!